Jim's Loire: Muscadet in danger! Can I taste your Melon-Colombard Muscadet blend please? If you want to upset a top quality Muscadet producer, this or a variant of the same, is the question to ask. There is now a serious likelihood that in the next couple of years producers will be allowed to add Colombard, Chardonnay and possibly other varieties to Melon de Bourgogne in the making straight Muscadet. For the moment this will not be allowed for the zonal Muscadets – Sèvre-et-Maine, Côtes de Grandlieu and Coteaux de la Loire or the cru communaux – but we all know about 'mission creep'. 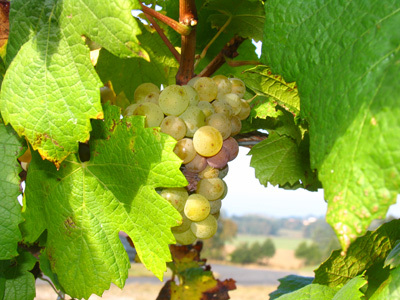 Many of the top Muscadet producers, like Vincent Caillé, the Luneau-Papins, Joseph Landron, Eric Chavalier, Gilbert Bossard and others, are vehemently opposed to allowing other grape varieties to be used for Muscadet. However, I talked yesterday to Bernard Jakob, the directeur général of Ackerman. He is in favour of the change as providing a way of saving those producers who are struggling in the Pays Nantais. Bernard quoted the vote by a substantial majority of the vignerons in favour of the change. When I pointed out that if producers wanted to blend other varieties to Melon it was already perfectly possible to do so and sell this as an IGP or a Vin de France. Bernard replied that producers wanted to be able to keep using the Muscadet name. I have to say that I have little sympathy with this move to add new varieties to the Melon de Bourgogne for Muscadet. Even, if the change, is strictly limited to straight Muscadet it is all too likely to undermine the image of all Muscadet just at the moment that the qualities of good Muscadet – and there are now some very good Muscadets – are being rediscovered. Currently top Muscadet is easily among the best bargains to be found in the wine world, so why threaten to potentially destroy all the good work that has been done by conscientious producers to produce excellent wines and raise the appellations image. The idea that producers want to be able to add new varieties while keeping the Muscadet name is deeply dubious. Just suppose that I have vines in the Clos de Vougeot or Chambertin and I wanted to include some Gamay or Syrah along with my Pinot Noir while keeping the appellation, I doubt if I would get a very sympathetic hearing. It would be very interesting to know more about the background to the vote by producers to allow other varieties like Colombard in Muscadet. There is, of course an administrative attraction in allowing producers to keep using the Muscadet appellation with the addition of other varieties as makers of AC wines are required to pay a cotisation (subscription), even though this has been considerably reduced recently, to InterLoire. If the wines are IGP or Vin de France then this cotisation is not payable. Furthermore is the addition of Colombard or other varieties really going to save struggling producers? Muscadet-sur-Colombard will surely be sold to supermarkets at a basement price in competition with the Côtes de Gascogne, cheap wines from the Midi as well as places like Australia, Chile and Argentina. Dealing with aggressive supermarkets is unlikely to provide salvation for struggling growers as the recent report into Tesco's habitual policy of screwing its producers to improve its bottom line only too clearly demonstrates – see here and here. I fear if this change goes through it is all too likely to be catastrophic for the Muscadet appellations. While I have sympathy for struggling producers they should be looking to IGP or vin de France rather than bastardising Muscadet.